On this date in our family history . . . the 29th day of August . . . in the year 1692 . . . after being accused of and arrested for the supposed crime of witchcraft, William Barker, Sr. "Conffesses he has been in the Snare of the Divil Three Years" . . . The entire case file for William can be seen HERE . 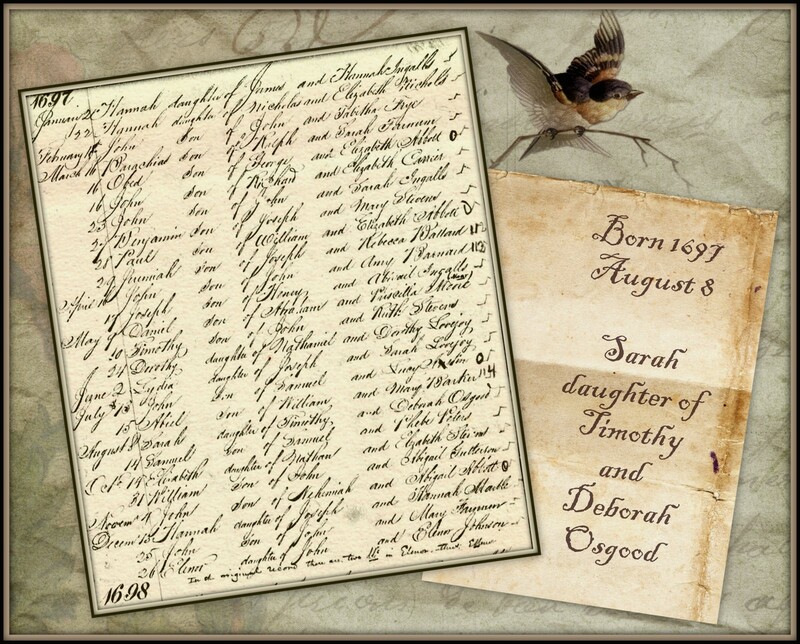 . . this William Barker is an 8th great-grandpa to the Keeper of this family history blog . . .
On this date in our family history . . . the 29th day of August . . . in the year 1670 . . . John Wheeler dies in Newbury, Massachusetts . . . this John Wheeler is an 11th great-grandpa to the Keeper of this family history blog . . . he is mentioned as one of the "First Settlers of Salisbury" on page ten of The Old Families of Salisbury and Amesbury where he is listed as John Wheler (#66) . . . and the text of his will as well as a brief bio can be found in History of the Wheeler Family in America, which has the following to say about him . . . He is said to have been born at Salisbury, Wiltshire, England, and to have sailed for America on March 24, 1633-34 in the ship "Mary and John," bringing his wife Ann and six children and leaving four sons in England. He spent the first year of his residence at Aggawam (now Ipswich), Mass. The following year he removed to the settlement on the north bank of the Merrimac River that was called Salisbury after 1640, and as one of its original proprietors, in 1641 he received land there which he still held and paid tax on as late as 1653, notwithstanding he had removed to Newbury, Mass., before 1650. He died at Newbury, Aug. 29, 1670, aged 52, and his wife Ann died there Aug. 15, 1662. On this date in our family history . . . An Inventory of the Goods & Chattles of Mr. Henry Hilleary taken & appraised by us the Subscribers in Current Money at Six Shillings P Spanish Dollar this 28th day of Aug. 1783 . . . this Henry Hilleary is a 6th great-grandpa to the Keeper of this family history blog . . .
1 Bay mare 17 Do. 1 Bay mare 11 yrs. Do. 1 Dark Bay hip shot 2 yrs Do. Cyder Casks to Contain 2900 Galls. 7 Vollumes of Nature Displayd. On this date in our family history . . . the 25th day of August . 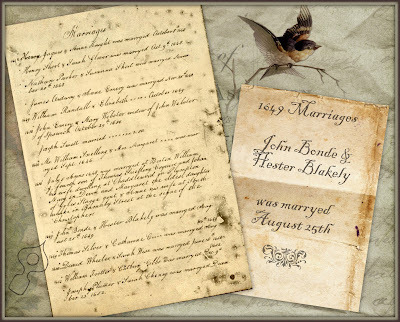 . . in the year 1649 . . . the marriage of Hester Blakely and John Bonde is recorded in the Massachusetts Town Vital Records Collection (compiled by the New England Historic Genealogical Society) . . . this John and Hester (Esther) are 10th great-grandparents of the Keeper of this family history blog . . .
On this date in our family history . . . the 6th day of August . . . in the year 1930 . . . Nancy Virilla Pounders nee Quinn dies in Franklin County, Alabama . 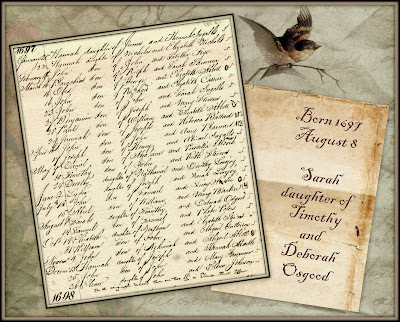 . . this Nancy is a 2nd great-grandma to the Keeper of this family history blog . . . and she will be laid to rest in the Spruce Pine Cemetery . . . just a few months before her death, Nancy Virilla penned the following words (with "original" spelling, grammar, punctuation) to one of her granddaughters in Texas . . .